Our classic and ever stylish spiral stair adds an accent to any room. Whether you need the functionality that only a spiral can deliver, or you need the form that only a spiral can provide, we have the right stair for you. Sturdy, yet graceful, the spiral stair will be a focal point of any area. 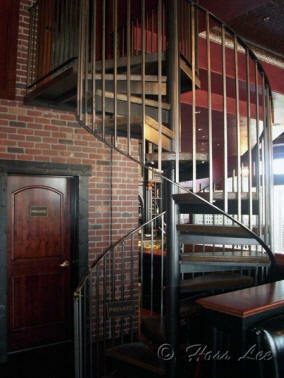 We see spirals used in both interior and exterior applications, for both residential and industrial/commercial uses. 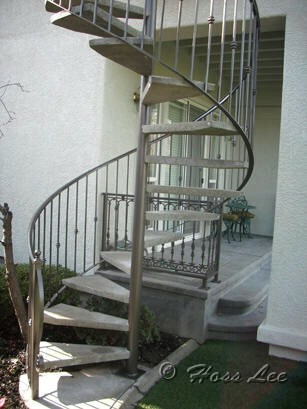 Steel Stairways builds custom curved staircases, spiral stairs, and circular stairways for residential and commercial sites for the Western States. Our designer steel and precast stairways are used by interior designers, architects and builders to complement their new construction and remodel designs for Modern, Colonial, Victorian, Traditional, Mediterranean, and Prairie homes and offices. We work closely with the architect, interior designer, builder, and homeowner to design and build the perfect custom curved stairway, precast spiral stair or circular staircase. We use the best materials in concrete, and metal to create stairways, stair railings and balusters that fit your design, budget and building codes. 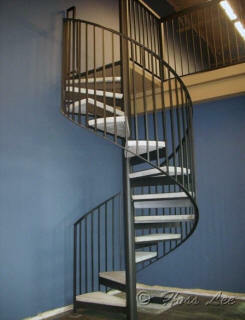 For new construction, remodels or historic renovation, Steel Stairways has the perfect staircase. Steel Stairways makes it easy to design curved stairs, spiral staircases and circular stairways using CAD drawing programs. 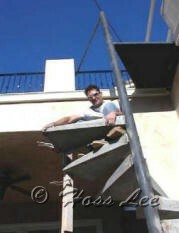 Hoss Lee’s Steel Stairways design and manufacturing capabilities are reason enough to come to us with your next project, and where you’ll truly notice a difference is in the service you will receive from us. Our superior customer service, attention to detail and scheduling, and ability to work with you on a solution that¹s right for your project will make working with us a truly satisfying experience. You can feel at ease knowing that Steel Stairway’s experienced and knowledgeable staff can handle any project from conception to completion. We offer delivery and installation on every product we manufacture. We are bonded, insured and hold all appropriate licenses. Let us provide a quote on your next project. Whether it’s a simple stairway or a complicated commercial project, you’ll see that our prices are competitive, and our superior experience and exceptional customer service will make you more than happy you called Steel Stairways.